The ProGram project (Information Prominence and Grammar in the brain) was an interdisciplinary project at University of Copenhagen. I did my PhD as a part of that project. We carried out research based on a linguistic theory and a neurocognitive model. The project was a collaboration between three different faculties at the University of Copenhagen with Kasper Boye as the PI and Jesper Mogensen and Hartwig Siebner the co-PIs. The linguistic theory, also known as the GRAM theory, places itself between the extremes of generative and construction grammar and defines grammar as being “less important” and always conveying secondary information. Lexicon, on the contrary, can carry the main point of an utterance. For instance, in the expression The boy walks we can omit the grammatical items and still understand the main point of the utterance: boy walk. But if we omit the lexical items, we will be left with the -s, which does not make any sense. Thus, lexicon would be primary and grammar secondary. The Reorganization of elementary functions (REF) model provides an account for functional reorganization in the brain, following a brain injury (e.g. stroke). The model places itself between the extremes of modularity and connectionism and suggests three levels of organization in the brain with only the top level being what we know as cognitive functions. Integrating these two theories, I explored language processing and working memory in the healthy and injured brain. I used various methods to answer my research questions. Firstly, I went to the literature and investigated how aphasia (language difficulties as a result of a brain injury, most commonly stroke) and working memory impairment are connected. Next, I looked at a French connected speech corpus to see whether pronouns classified as grammatical would be more impaired than the lexical pronouns. For instance, the first person singular pronoun je would be grammatical (cannot be stressed or focalized), whereas moi would be lexical (can be stressed or focalized). Indeed, most of the participants had omitted pronouns classified as grammatical, despite them being obligatory in most of the contexts. One of the participants, however, used more grammatical pronouns than the non-injured control group, which could have been a result of reorganization in the brain, thus creating an imperfect post-stroke grammar. I also ran an experiment, using a well-matched paradigm to check how increasing working memory load would impact language production. In this paradigm I contrasted the Danish indefinite article en/et (classified as grammatical) to the numeral en/et (classified as lexical). While doing the production task where they had to produce a determiner-adjective-noun phrase (e.g. ‘a red letter’), they also had to memorize some words to recall in the end. It turned out that increasing working memory load made production faster. Although counterintuitive, it was something that had previously been shown in the literature. Finally, I used transcranial magnetic stimulation (TMS) to modulate the anterior and posterior parts of Broca’s area and to test whether different parts are responsible for the processing of the indefinite article en/et and the numeral en/et. Through TMS one can create transient virtual lesions and thus observe causal relationship between a brain area and a function. 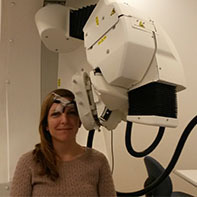 I ran this experiment in the Danish Research Centre for Magnetic Resonance (DRCMR) and I used the TMS robot to stimulate the brains of the participants. It is not always a pleasant experience to have your brain stimulated but it is safe. Our preliminary findings were the opposite of what we were expecting. The production of the utterances containing the grammatical en/et slowed down when stimulating the anterior part of Broca’s area, although we expected that part to be responsible for the lexical en/et. Moreover, the duration of the grammatical en/et decreased, when stimulating the posterior part of Broca’s area, which could be an indicator of TMS facilitation. Indeed, sometimes TMS facilitates the performance of certain tasks instead of inhibiting them. We are still working on the analysis and preparing a manuscript for publication. If you want to learn more about my PhD thesis, you can download it here. Byurakn Ishkanyan is a postdoctoral researcher at the Puzzle of Danish project at Aarhus University.